The new "Akhir 100" has just been launched. 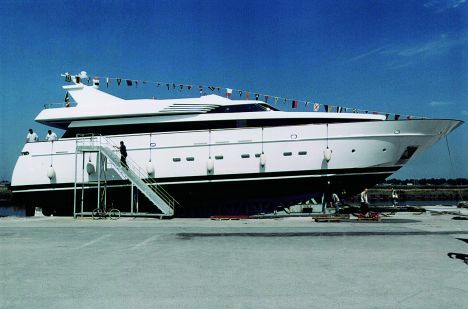 This 30-m boat is the first built of the new model proposed by Cantieri di Pisa and will become part of the shipyard's range, filling the gap between the "Akhir 85" and the "115" (the latter is an updated version of the "Akhir 110"). The "Akhir 100" has the same style that has now become the distinguishing mark of the Tuscan shipyard while, for the interior of this first boat, the shipyard has created areas decorated with typical Oriental style materials and colours. As far as the motorization is concerned, it consists of two 2,000-HP MTU 16V engines, with which the "Akhir 100" reaches a cruising speed of 25 knots, with a maximum of 28 knots, giving it a range of 600 miles. Cantieri di Pisa has paid particular attention to the soundproofing and has obtained excellent results thanks also to the use of the latest technologies and materials. The "Akhir 100" is intended for those owners who want fast cruising with maximum comfort for all onboard. The interior includes three cabins for the five-person crew, a VIP cabin, a guest cabin with twin beds, an office with sofa-bed and a full-sized owner's cabin astern. On the main deck, we find the dining room and the large saloon, all finished in fine wood and panelling which, given the combination of the stylistic motifs between one area and another, enhances the weng furniture, beautifully made according to the best ebonist technique. The ceilings are covered in silk while the interior panelling is of brushed teak, a classic Cantieri di Pisa detail. The bathrooms, too, one for each cabin, have been finished with the finest materials, including marble such as white onyx, Afyon, travertine and emperador. The first boat of the line launched, named "Unica", will be shown at the Monaco Yacht Show. For further information please contact: Cantieri di Pisa; Via Aurelia Sud; km 334; 56121 Pisa; tel. : +39 050 220551; fax: +39 050 500799; Web site: www.cantieridipisa.it; e-mail: info@cantieridipisa.it. Sleeping accommodation for the crew: 5/6.